This classic, vintage-style trophy is part of our Antique Action Resin Series, and is a design that will never go out of style. This 10-inch resin trophy is silver in color with delicate gold detailing, and features a female cheerleader with one pompom raised. Choose this trophy for a passionate cheerleader of any age or ability. 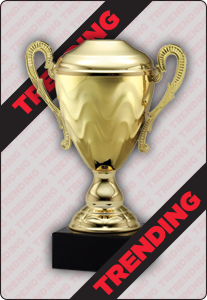 Engrave a message or event details to make this trophy extra special.